cost effective way to advertise. Direct, targeted and brand enhancing. or even as a source of revenue when advertising space is sold to suppliers. 'magically' transform into a video or animated graphic with one click of your smartphone. land on a targeted page of your website or Social Media account. Promeroll’s unique strength lies in its ability to help retailers turn plain white till rolls into colourful mini-posters, which provide massive support for their different retail sales channels and marketing calendars. Promeroll offers value for money, high impact messaging. We take plain reels of Thermal till roll paper and bring them to life by printing colourful receipts which can include high quality picture images, giving retail staff, at store level, the opportunity to ‘hand deliver’ good news to their customers by means of money off vouchers and promotional offers. 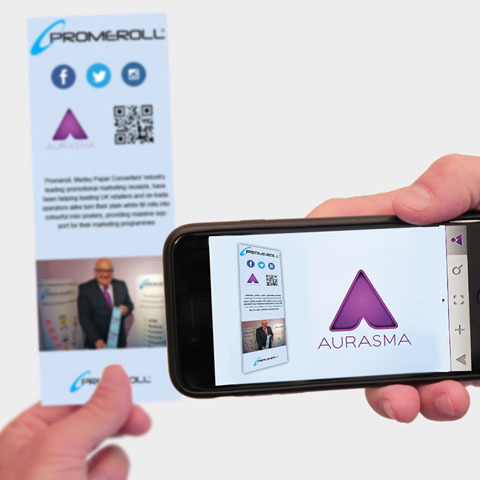 The flexibility of being able to produce quantities suitable to match marketing campaigns, has allowed company’s to use Promeroll as an effective way to inform their customers about promotional activities. Promeroll can form an integral part of a company’s marketing calendar, as it offers a unique way of reminding customers, of promotions and special offers, even after they have left the outlets. Offer customers an incentive to revisit you. Use Promeroll to advertise discounts, money off vouchers / online voucher codes or upcoming special offers and events. Promeroll is proven to be more cost effective than newspaper adverts and leaflets in promoting your business. Use bounce backs to encourage further visits and ‘sell’ the space on the reverse of your receipt roll to your suppliers in order to promote their products. Advertise your website using Smartlinks including QR codes or Aurasma, or use Promeroll to encourage people to download your App. Latest figures indicate that people using your company’s App, increases sales by up to 15% and you gain valuable analytical data. Make customers aware of your unique offers. Use Promeroll to promote your Social Media sites and help reinforce your brand awareness. how can i get promeroll? GETTING SET UP WITH PROMEROLL IS EASY, YOU MIGHT EVEN QUALIFY FOR ONE OF OUR FREE TRIALS! (7 boxes of 20 rolls providing 156,000 x 200mm receipt images). Subject to discussion with our experienced sales team. Contact us on 01536-274273 or use the enquiry form below to discuss what Promeroll can do for your business.